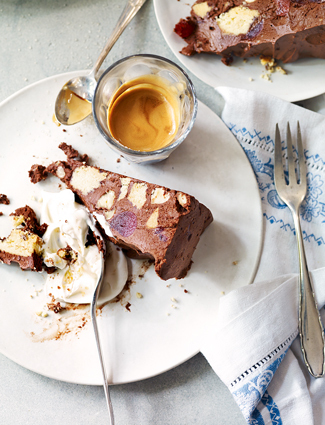 A yummy chocolaty dessert with a naughty adults-only twist that doesn’t need an oven – just pop in the fridge overnight and enjoy! Place the chocolate in a large heatproof bowl over a pan of barely simmering water. Stir occasionally until melted. In a separate bowl, lightly whip the double cream, then fold in the yoghurt. Set aside. Mix the coffee and Tia Maria together in a small pan and warm through. Add the glucose syrup and stir to incorporate. When the chocolate has melted, pour in the coffee mix, and then fold in the broken biscuits and cherries. Now start to fold the cream and yoghurt into the chocolate mix until well combined. Pour the mixture into a 25cm round springform cake tin, smooth the surface and refrigerate for 12 hours. To serve, turn the cake out onto a board and cut into 10 slices – then enjoy! Taken from Total Greek Yoghurt by Sophie Michell. Published by Kyle Books, priced £ 19.99.